Wireframing tools make creating a website or application fundamentally easier. It simplifies the communication between UX designers and clients and saves us much time on product development. 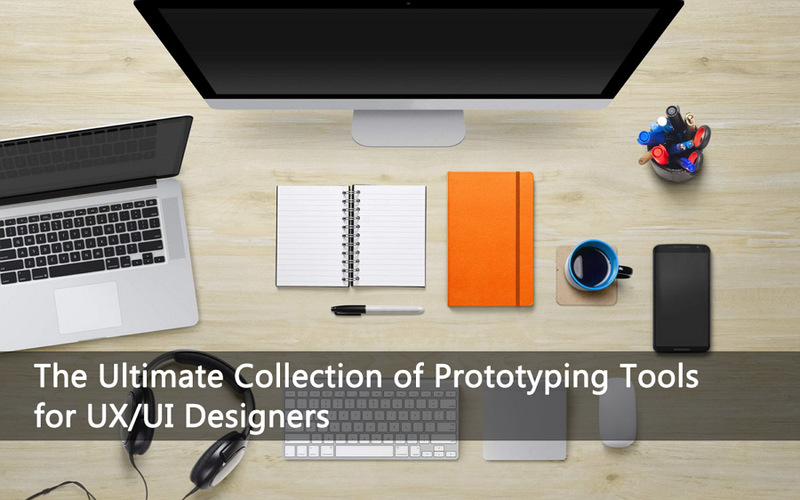 This post has listed more than 20 different UX prototyping tools. These tools are used to create click-through prototypes of web, desktop and mobile applications. Prototypes are built with images from existing screens. It allows you to upload image from Photoshop, local, Dropbox, Google Drive etc. With just a few clicks, you can link the screens together and turn your designs into interactive mobile and web prototypes. Invision - With InVision, you can transform your static web & mobile (iOS, Android) designs into clickable, interactive mockups rapidly. Image can be uploaded from local, Dropbox, Google Drive and Box. The collaboration feature is great. Marvel - It’s an easy-to-use application to turn your designs into clickable prototypes. The clean interface helps us focus on the design. Flinto for Mac - This is a Mac only prototyping tool. If you are a Sketch user, Flinto has a handy plugin that allows you to import Sketch files with one click. Atomic - Atomic allows you to quickly link your designs using a range of gestures and transitions for mobile or desktop. Atomic has built-in drawing and layout tools which allow us to draw some basic UI elements. These tools are ideal for mobile mockup and prototype as they come with a standard library of mobile widgets. They provide you with different mobile templates based on device size. It offers some fast ways to preview your design on real device. Proto.io - It is a good software for mobile wireframe and prototype as it allows to view the prototypes offline and comes with a lot of mobile widgets. Mockplus - Mockplus is great for mobile prototype. With 3000 icons and 200 components, you can build interactive mobile prototypes by simple drag-and-drop. We can choose the mobile template based on size when starting design. Several ways areavailable to view prototype on mobile device: view in mobile browser, view through View Code, Scan QR code etc. Fluid - Fluid is a web-based wireframing tool. It's a good tool if we want to make a mobile application prototype, including iOS, Android and wearable device. Pixate - Pixate is a desktop-based prototyping tool allowing you to build animations and interactions. It can only be used to make mobile prototype. Justinmind - It is a desktop-based prototyping tool and good for high-fidelity mobile prototypes. It supports for complex interactions, animations and gestures. The learning curver is fairly high. Axure - Axure is great for prototyping web app or desktop software that include complicated interactions. Strict logical thinking skill and programming knowledge are required to master this tool. Webflow - It’s a web design tool, CMS, and hosting platform in one. Webflow is a website builder that automatically generates clean code as you design. Webydo - It helps you create pixel-perfect, responsive websites for your clients. Webydo will automatically convert your design into an updated HTML code + CMS (Content Management System) for your client. Indigo Studio - Prototypes can be created from existing mocks or by building out individual elements for each screen within Indigo Studio. Protoshare - It is a prototyping tool with moderate learning curve. ProtoShare helps teams visualize requirements with interactive website prototypes. Fluid - Fluid is an easy-to-use wireframing tool can be used to make static wireframes quickly. Balsamiq Mockups -It is a hand-drawn style wireframing tool and reproduces the experience of sketching on a whiteboard. It is good for simple static wireframe. Mockflow - Mockflow is a simple wireframe tool. These tools allow you to add interactivity to individual elements. Both basic interactions and complicated interactions can be made with them. Generally, the more interactivity, the higher the learning curve. Axure - A robust prototyping tool can made very complicated interactions. The learning curve is a little bit high. Mockplus - Mockplus is a new and fast-growing rapid prototyping tool. The interaction design in Mockplus is fully visualized, that's WYSIWYG. It allows your to add page link and interaction for components with simple drag-and-drop. Impatient jerks like myself can build an interactive prototype easily with drag-and-drop. UXPin - UXPin is a web-based tool for prototyping web or mobile apps. It has a coherent interface and dozens of libraries with various items to be used in a design. It can be used to create both static wireframes and interactive prototypes. Proto.io -You can use the Containers to create functioning animations and interactions. It can be used to build both low fidelity and high fidelity mockups/prototypes. HotGloo - This is an online prototyping tool that allowing to make prototypes with basic interactions.